You’ve heard a lot of people recommend putting a few loops of coax near the feed point of your antenna to keep the RF energy out. How does this work and why is it needed. 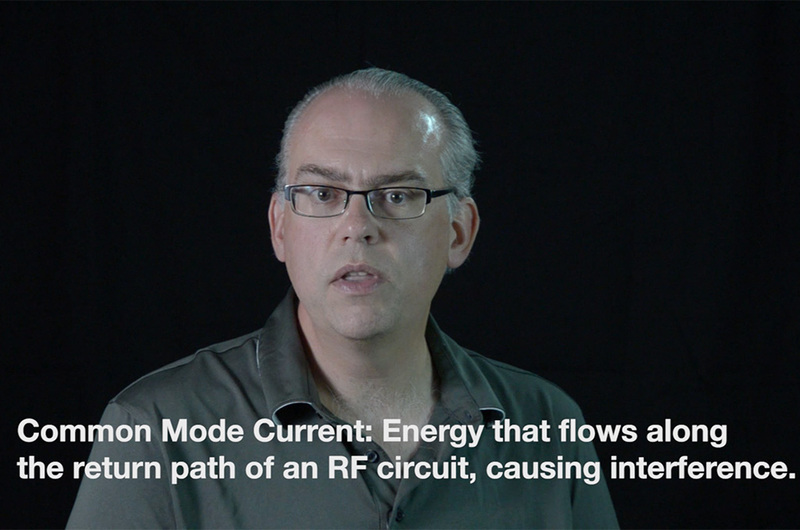 Watch this episode for more information on common mode currents, baluns, and RF chokes. A few weeks ago I purchased a J-Pole antenna and it seems to work very well with RG-8x that runs to my transceiver. However, I’m wondering if it will work even better if I add a few loops of coax next to the antenna. This question opens up the discussion on common mode currents, what a balun is, and why certain antennas benefit from using them. Baluns can be very complex and there are entire books written on the subject. Baluns provide an important part of your antenna system by matching, or transforming the impedance of the transmitter to the antenna. Balun is a contraction of two words: Balanced and Unbalanced. Often they are used in connecting balanced antennas, like dipoles to unbalanced feed lines, like coaxial cable. Coaxial cable is an unbalanced feed line. The RF energy current runs up the center conductor and returns back down the outer braid. The shielding in coax prevents it from radiating RF energy so coax is a great choice for VHF and UHF antenna systems. Now the RF current doesn’t actually run through the wire itself, but along the outer surface by way of a phenomenon known as the ‘Skin Effect.’ In an ideal situation the returning RF energy will travel down the inside of the coax cable’s braid. But if there is a mismatch in some way, that is has a high SWR or some other issue, that energy can flip and instead travel down the outside of the braid. This current running down the outside of the coax braid is what we refer to as common mode current. You see, the way coax is designed is that it is it’s own little Faraday cage. RF Energy travels up the center conductor and returned back down the inside of the braid. The outside of the braid is designed to keep the cable from radiating, like a Faraday cage keeps RF signals confined within it. If the signal is on the outside of the cable braid, then the coax turns into a radiator, or an antenna itself. So, how do we keep the common mode RF energy from traveling down the outside of the cable? With a special type of balun, of course. Remember way back to antenna theory 101. For an antenna to radiate its RF energy, it needs to have an impedance that matches the transmitter. In the case of amateur radio, this would be 50 ohms. So we build our antennas to have a 50 ohm impedance. In an ideal world, the RF energy travels out the transmitter, up the feed line, into the antenna, and gets released into the ether. The RF current that transported that energy then returns back down the inside of the braid of the feed line and completes the electrical circuit. But, in some cases, you may have a 50 ohm antenna, but due to some type of imbalance or mismatch in your antenna system, not all of the RF energy is being released but instead returning back down the outside braid of the feed line. This causes the cable to radiate or exhibit high SWR to your transmitter. In order to keep that RF energy off the braid, we also need to raise the impedance of the outer braid, so we’ll use a variation of the balun called an RF choke. RF chokes are simple make, For VHF and UHF antennas, all you need is to take 5 turns of coax and loop it into a 4 inch diameter circle. Secure the loops with electrical tape or zip ties. Placing this choke or balun near the feed point of the antenna will increase the impedance of the outer braid of the coax to 2000 ohms or more. And since RF energy will seek the path of least resistance, it will be stopped by the choke. What if you’re using a real stiff cable that can’t be easily looped. A second option is to use these snap on ferrite beads. These ferries clamp onto the outside of your cable and perform the same function as the loops of coax. For VHF and UHF operation, 3 of the Type 43 mix ferrites should be sufficient. So do you need a balun or RF choke with every antenna? The answer is no. It really depends on the type or style of antenna and the feed line you are using. For example, a center fed antenna like a dipole is considered a balanced antenna. If you connected it to an unbalanced feed line like coaxial cable, a balun will be necessary to keep the common mode RF energy from traveling back down the antenna. But end fed antennas like a 1/4 wave ground plane antenna is considered to be unbalanced. You could connect an unbalanced ground plane to your unbalanced coax without the need of a balun or choke of any sort. But what about the J-Pole antenna referenced in our original question? This is where it gets very interesting. The J-Pole is an end fed antenna, so you would assume it was unbalanced. But it is also half wave antenna so it’s like a dipole in disguise. It is kind of like an end fed dipole so it actually is a balanced antenna. So a balun or choke is necessary since the antenna is balanced and the feed line is unbalanced. This will prevent those common mode currents from running back down the feed line. With all that said, can you operate without a balun or choke? Of course you can. If the stars align, and you have a perfect match between your antenna and feed line, you’ll get by without needing a balun. But any little imbalance or mismatch can also throw the system out of whack and adding that balun or choke will most likely solve any performance issue you’re having. As I always say, a balun never hurts and usually will help the situation. Great question. Using a form to create a neat line of coils will create a stronger inductance, and thereby, a better choke than if you do the ‘crazy wrap’ style of coiling the cable. If you can wind the coils on a form, I’d recommend you do that. Used plastic containers make great forms- they can be trimmed down and the whole thing wrapped with electrical tape for a clean appearance. When feeding a semi-balanced antenna like an OCF dipole directly (without a balanced feeder such as a ladder or equal), I always recommend an 4:1 current balun (such as the Guanella). The Guanella has an inherent common-mode rejection and does not crave any further protection against feeder radiation. The same goes, naturally, for all dipoles fed directly via an X:1 (whatever ratio is required) current balun. whole chain from the outside on your coax, your radio and anything else connected to it in the shack. In this situation a choke balun is mandatory, as described in the great article above ! Thanks for your comments and sharing your experiences. Off center fed dipoles and HF verticals almost certainly need a balun to drop the impedance down to 50 Ohms. In the sake of brevity I didn’t talk much about HF antennas in the video, but I’m planning a followup that will address those issues. I DISAGREE ON THE POINT OF NOT NEEDING A COMMON MODE CHOKE. THERE IS TOO MUCH OVERT & UNWANTED RADIATION BY CMC’S. IT DOES NOT AFFECT YOUR SWR ANY MORE THAN “HIGH SWR WILL BURN YOUR RIG UP”. WHAT A JOKE! RUNNING YOUR RIG OUT OF TUNE WILL! ALSO IT IS NOT A “CHOKE BALUN” AS MANY CALL IT, IT IS A CHOKE! ON THE CHOKE QUESTION FROM KG3L; THE NUMBER OF TURNS AND DIAMETER ARE NOT AS IMPORTANT AS THE LENGTH OF COAX USED IN THE MAKING. YOU WOULD GET A LITTLE OVER 11 FEET WOUND IN A “LASSO” COIL A LITTLE LESS ON A 6 INCH FORM. TO BE EFFECTIVE ACROSS THE H.F. SPECTRUM YOU SHOULD HAVE ABOUT 23 – 25 FT. OF LENGTH. I PUT FITTINGS ON A 25′ PIECE OF COAX, WIND IT AROUND A 1 GAL. ICE CREAM CONTAINER AND SECURE IT TOGETHER W/ CABLE TIES. THE CHOKE SHOULD BE LOCATED AT THE MATCHBOX [ITS NOT AN ANTENNA TUNER. DO YOU HAVE A LITTLE BOX THAT CLIMBS THE TOWER AND MAKES A PHYSICAL CHANGE TO THE ELEMENT? THAT IS HOW YOU TUNE AN ANTENNA. THAT BOX ALONGSIDE YOUR XCVR IS FOR MATCHING YOUR ANTENNA “SYSTEM” TO YOUR RIG. SIGN ME A HAM FOR 60 YEARS ’73 RICH, KF9F. BTW WANNA SAVE MONEY TRYING DIFFERENT DIPOLE AND WIRE ANTENNAS? GO TO YOUR NEAREST FARM SUPPLY STORE AND GET A ROLL OF ELECTRIC FENCE WIRE. $20 WILL BUY YOU ABOUT 1600 FT. NO ITS NOT COPPER, BUT HAM RADIO IS NOT A PROFFESSION EITHER. ENJOY ES GL.